So you want to become a successful wholesale investor but you’re not quite sure if it’s in your reach? We’ve all heard that wholesaling can be a perfect and often profitable way to begin investing in real estate but it doesn’t happen without putting in time to learn know how to crunch numbers, market the product, and prospect sellers. I honestly don’t know a single wholesaler who hasn’t made every mistake in the book. Truth be told, some learn from their mistakes, some don’t. If you learn from the mistakes you make along the way, you’ll be successful. And if you don’t, well, you won’t get off first base. Remember, practice makes perfect. Before you prospect a seller, do your research. Get to know as much as you can about both the property and the seller so that you know how to approach what could be a difficult discussion. Remember, wholesale deals often come by as a result of some sort of difficulty the seller is having. It could be financial difficulty, divorce, illness, or even the death of a spouse. And most sellers have an emotional attachment to the property, therefore, you will need to be patient and willing to listen to the hardship that comes with their decision to sell. Like any skill, it takes practice to negotiate. Negotiating isn’t about manipulating the seller so that you get what you want. Listen to the needs and wants of the seller and then through that information try to figure out a way the deal can work in order to accommodate both sides. It’s equally important that you not be afraid to express what you want. And it’s okay to be assertive as long as your primary goal is to gain the trust of the seller. Without trust, you have no deal! Above all, be honest. Don’t be afraid to tell the seller you are a wholesaler and explain what that means. After all, wholesale only works when there is “full disclosure”. Once you land the deal, it’s time to find an end buyer and the same principals apply. Honesty is KING! Full disclosure is required and never try to present yourself as the owner of the property. If you do, you can and most likely will get sued if something goes wrong. And you wouldn’t want that to happen. Always get an earnest money deposit from your end buyer. You’ve heard the old saying “skin in the game”. If the buyer has no skin in the game, they can walk away from the deal and then you run the risk of losing the trust of the seller and incurring charges for the title search and examination fees. My experience tells me that if a buyer is unwilling to give a deposit, they are almost never serious about purchasing the property. And they usually don’t show up for closing. Most successful wholesalers get a minimum $2000 non-refundable deposit. Likewise, most seasoned investors purchasing from wholesalers expect it. The deposit should always be held in a non-interest bearing escrow account. By now, you should have a very close relationship with a title company. If you don’t, you put the cart before the horse because your title company is an essential part of your success and they should be an intricate part of your inner circle. South Jersey Settlement Agency (SJSA) is by far the most investor friendly title insurance company in New Jersey. If you contact the owner, Christine Tartaglia, you’ll find you have a friend for life! First and foremost, her goal is to transfer knowledge so that you can eventually become a successful and marketable wholesaler. Wholesalers become successful only through repeat business and creating your inner circle is most important. That way the process is the same time and time again. Be sure you have a clear and precise contract and one that includes protections for all parties involved. The contract must include an assignment clause so that if you decide to assign vs double close, you have the right to do so. Most important, give yourself enough time in the contract to find an end buyer and for the title company to clear title. The rule of thumb is 30 days and if your contract states closing shall occur “on or before” whatever date you come up with, you can close as soon as the deal is ready. That way you don’t have to worry about going back to the seller for an extension should your contract end up expiring before all the ducks are in a row. Investors often make the mistake of not giving the deal sufficient time to run its course only to end up losing the deal because they made promises they couldn’t keep. If you lock arms with a good title insurance company, like SJSA, they will take the bull by the horn and get your deal to the closing table. But remember, the title company’s primary goal is to produce a bulletproof owner’s title insurance policy that provides the end buyer assurances title is free and clear of all liens and encumbrances. 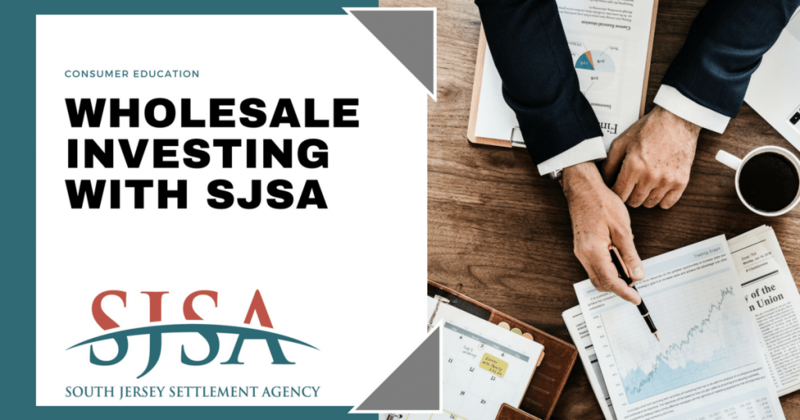 SJSA will provide you with the step by step processes and will take time to transfer knowledge only to ensure you become a respected wholesale investor that buyers want to deal with time and time again. Call SJSA today at 856-690-1121 for a guided tour to help you get started in the wholesale space.